Check it out! Multi-Delivery "Corporate" Discount! Get 3 or more Veggie Boxes delivered to your home or business, and the price drops by $50 each! Sometimes referred to as Vegetable Subscriptions or Community Supported Agriculture (CSA), our Veggie Box program will bring delicious, fresh produce straight to your door! How does it work? 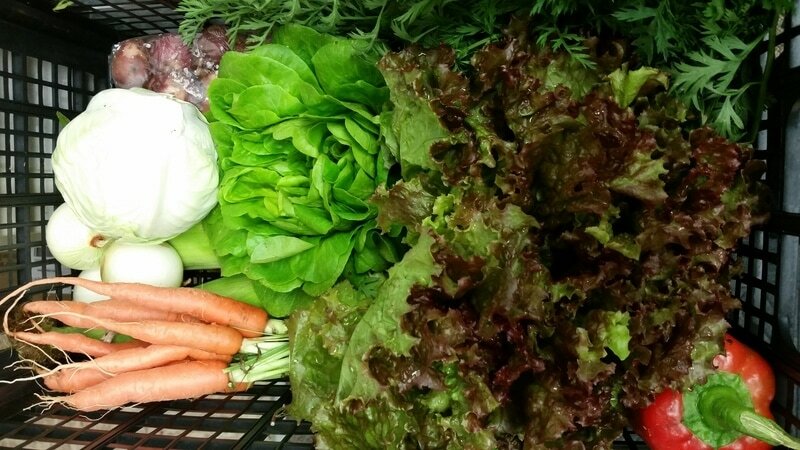 You prepay for the season and then for 15 weeks during the season (starting early-mid June), you'll get a box of a lovely variety of fresh produce grown by our farmers! By working together, our farmers can offer the most diverse vegetable box around! When are the deliveries? We'll start in early/mid June! 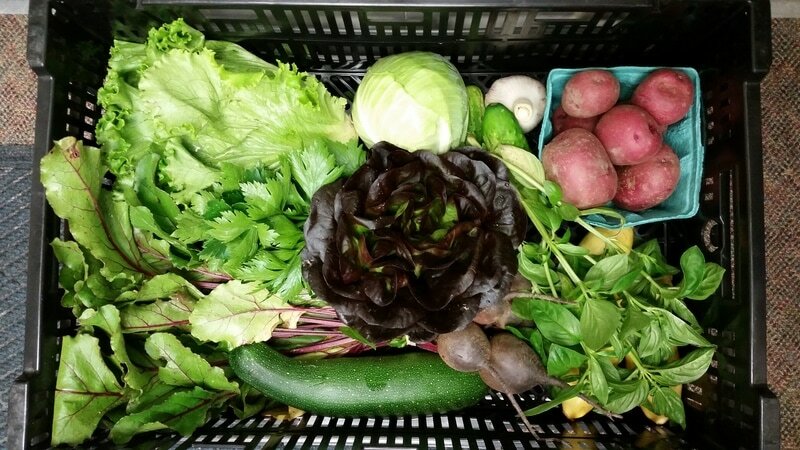 Our farmers pick and pack their fresh produce for pick up on Tuesdays and Fridays. Once the delivery personnel pick up from the farmers, the veggie boxes are assembled and packed into the reusable crates and delivered. You choose which day you prefer to get your veggie boxes: Tuesdays or Fridays, generally late morning or early/late afternoon depending on the route. What can I expect in the Veggie Box each week? Because of the seasonality of Garrett County's farms, each week you'll receive a different variety of fresh produce in your Veggie Box! Early on, you'll have lots of greens, green onions, lettuce, radishes, sugar snap peas, strawberries, new potatoes, herbs, etc. 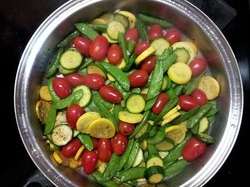 Later on we'll add raspberries, peppers, tomatoes, summer squash, green beans, and more! Later still you'll start also getting winter squash, beets, celery, pumpkins, etc. We think the quantity each week will serve a family of four. What does a Veggie Box look like? We will pack a wide variety of vegetables, fruits, berries, and herbs in your Veggie Box, a returnable crate each week. Just leave your empty crate for us to pick up. We wash the crates each week. (You can see pictures of veggies boxes from 2016, above). What does it cost? If you get a single Veggie Box delivered to within 2 miles of Rt. 219 between Accident, McHenry, and Oakland, or 2 miles from Grantsville, the cost for the season is $450. You'll get an average of at least $25 worth of fresh vegetables, berries, herbs, and more each week, delivered to your home or business. Multi-Delivery Discount: Get 3 or more Veggie Boxes delivered to your home or business, and each subscriber saves $50 for the season! Contact us to see if your location is in our delivery area. Can I pay in installments? Sure! Just mail us your first of three monthly payments of $150 along with your contact information to the address below. ﻿Or, from our order page you can pay with your credit card in three monthly payments of $150 for single delivery. Multi delivery discount folks can pay two payments of $150, and one of $100. (Note - you'll have to come back to the order page to do each installment - we're not set up to accept recurring payments - sorry!) Your final payment must be received by September 1. What if I want a Veggie Box delivered further than your delivery area? If you live further than two miles off Route 219 between Accident and Oakland, or more than two miles from Grantsville, you can have your Veggie Box delivered to a friend's home or business, one of our other delivery points listed above, OR we may be able to deliver, but we may need to add a delivery surcharge onto the Veggie Box price. Contact Us to make arrangements. Go to our order page to get started. You can send us a check today with your Name, email, cell phone number, location of the drop off, and whether you prefer Tuesday or Friday deliveries! Or you can sign up on our order page! Veggie Box subscribers - be sure to check your email inbox (or spam, or promotions folder) for notices from Garrett Growers about your Veggie Boxes!